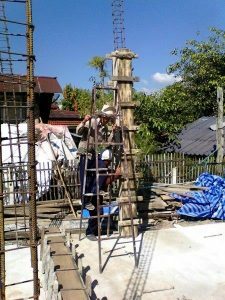 Columns from Foundations to Roof for a Thailand House. 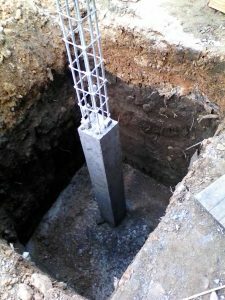 The specifications for concrete columns, or piers, can be seen here. 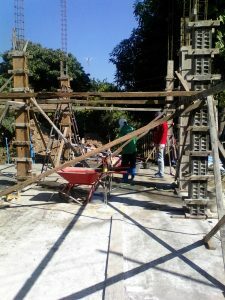 All columns – 6 x 12 mm rebar and 150 mm x 150 mm x 6 mm dia. steel stirrups @ 150 mm ctrs. 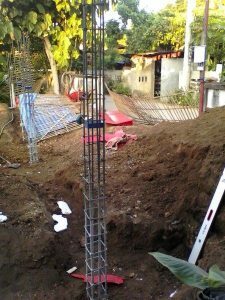 All columns have 6 pieces of 12 mm diameter, deformed reinforcing steel bar, rebar. The steel is often called rebar. 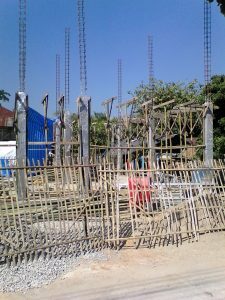 Rebar comes in a few different grades, 40 is most common, 30 is softer steel and not recommended for footings, columns and beams. 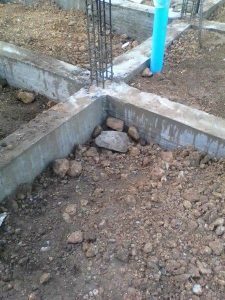 The six pieces of rebar are well embedded into the concrete footings and extend to about 300 mm beyond the very top of the concrete columns. At the top of the columns, they are securely welded to a roof bearer and then bent to hook over the roof bearer. 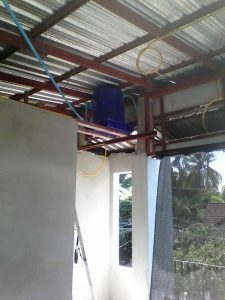 It is not necessary to weld all six rebars to the roof bearer. 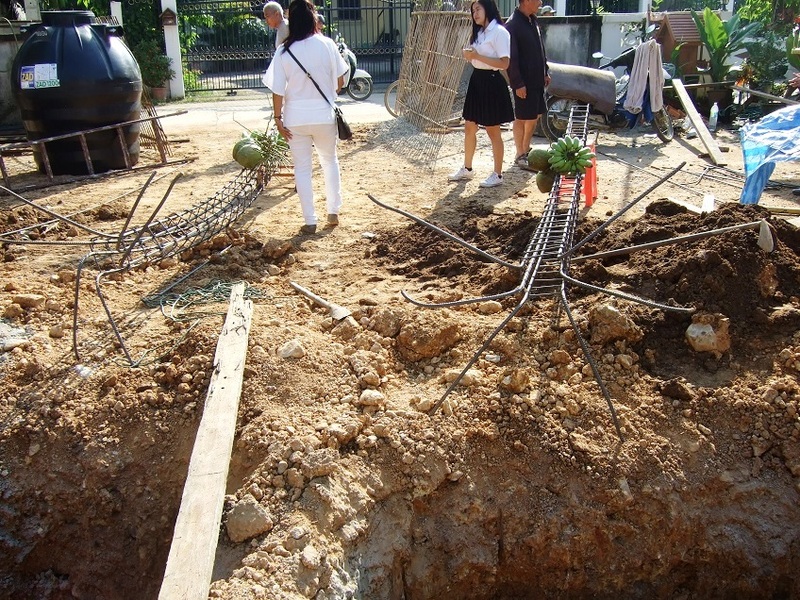 Rebar comes in 10 meter lengths and can be cut and joined where needed. The join should have about a 1 meter overlap and be tied, not welded. The 12 mm rebars go inside the 150 mm x 150 mm steel stirrups and are tied with doubled strands of wire at every intersection. See also – Tying steel rebar. 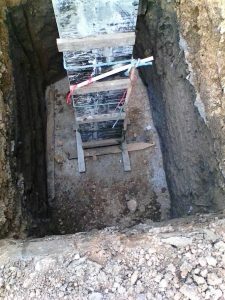 Where the 12 mm rebar needs to be joined for longer lengths, it is overlapped by about 1 meter and tied at every intersection with the stirrups. The stirrups are 150 millimeters apart. 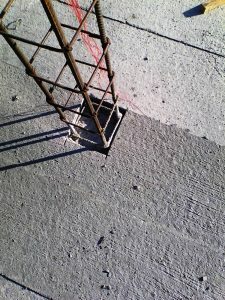 The broken sides of the stirrups should be staggered along the rebar. Best to buy the stirrups ready made as they are reasonably priced and workers making them by hand can slow the job up. 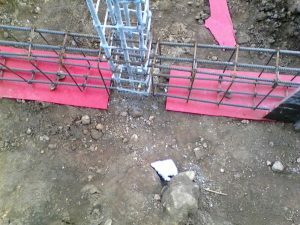 All rebar needs to be cut and bent on site.See cutting rebar. There are simple tools for doing this. A bench needs to be erected. Care should be taken that columns are poured to the correct height or they may need to be chiseled back or build up so that the beams can be poured so as to be resting on top. 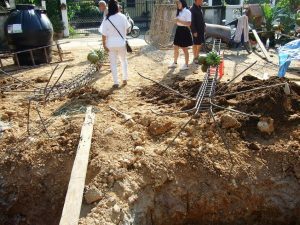 During the traditional Thai ceremony, the reinforcing steel for the first two piers was secured in place when the concrete was poured for those two footings. 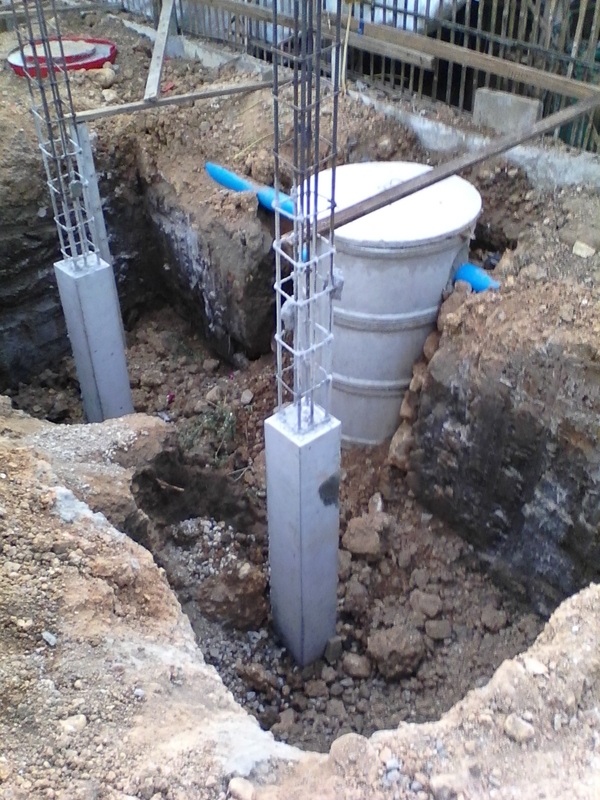 See in the image how the column steel reinforcing bar is splayed out diagonally to reach well into the concrete footing pad. Because of the small block, the six footings and columns at the back of the job needed to be done first, this gave room to fill the soil around those completed columns and dig the holes for the following six footings. Normally all footings would be completed first and all columns poured by ready mix truck. The shutters would have been hired as I did for the next level of the building. I bought a set of steel shutters which you might notice in some images, they are 1.5 meters high and forma 200 millimeter square. For shutters I bought two sheets of form ply, 2.4 x 1.2 meters, they were each cut into four pieces and used to form up for two columns at the one time. After each lot of footings were in place I re-used these form ply shutters. The concrete for these lower columns was mixed by hand. See – mixing concrete. 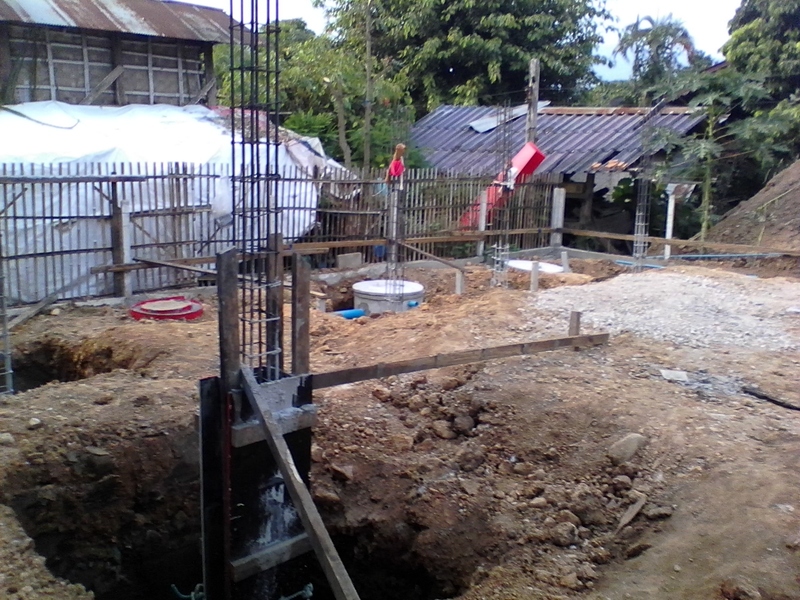 The rebar is 10 meters in length. 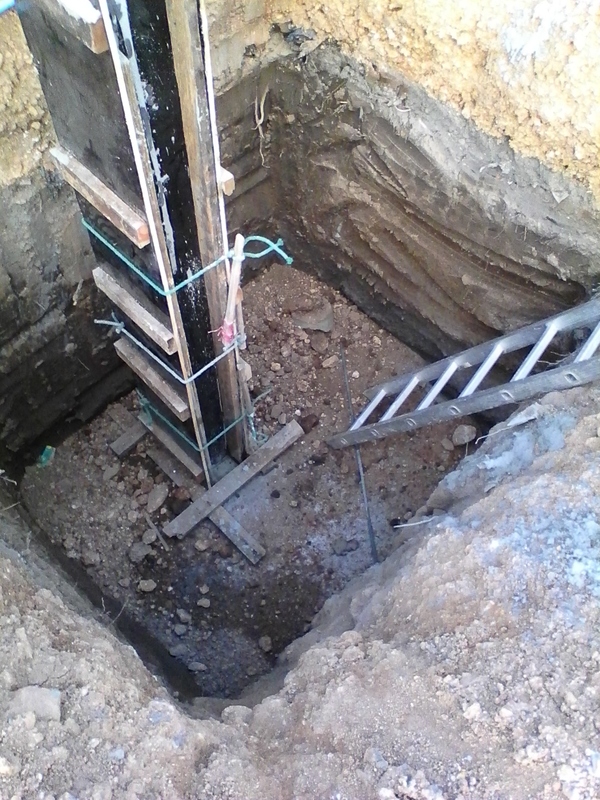 The 10 meter lengths of bar were cut in half, this gave about 2 meters sticking up through the ground floor. If I was to build another house, I would definitely buy two sets of 200 millimeter square x 1.5 meter long shutters. The 1.5 meter lengths can be bolted together to give a 3 meter shutter for columns. I would pour each column by hand and do it myself with the easy to use steel shutters. The shutters are removed from the columns the next morning after pouring.